I think the shield bugs must be one of my favourite groups of insect. There’s something about them; they look so determined waddling around like minute clockwork toys. When they fly they make a loud whirring noise out of all proportion to their size and have a habit of landing on me if I wear green in the garden (must stop wearing that Robin Hood outfit!) 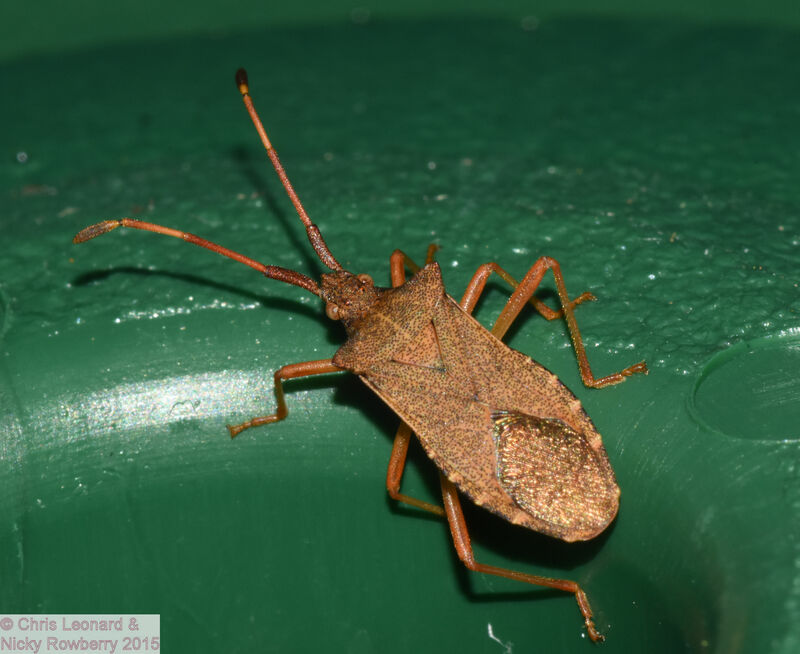 Besides my prized Box Bug from a previous blog post, we’ve recorded 6 other species in the garden – all cute little characters in their own right. By far the most common is the Green Shield Bug. Their exoskeletons are leathery with small dark pits all over them. In the spring and summer they are green like the one below, but in the autumn and winter they turn a bronze colour. They start of as tiny nymphs and develop through various stages called instars before taking their adult form. 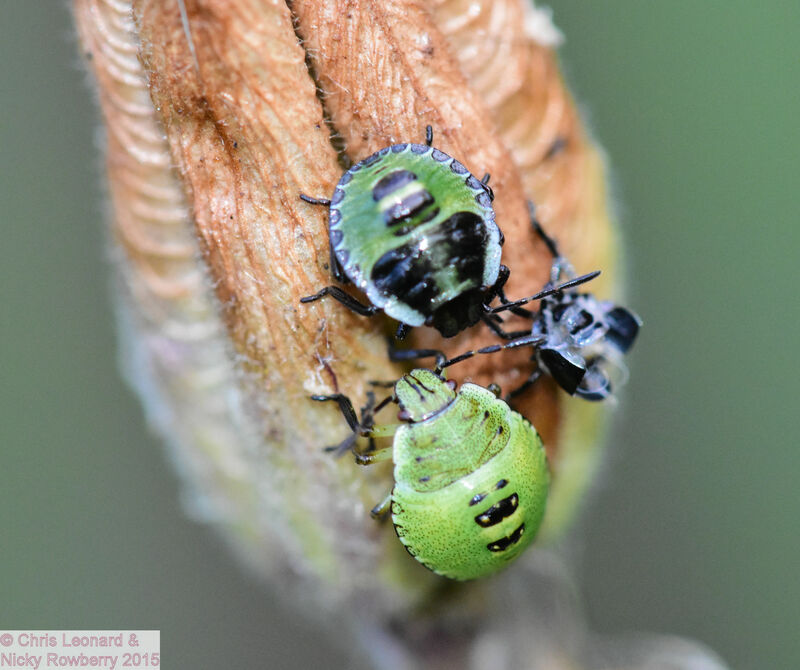 The photo below shows a couple of these instars (possibly 2nd and 3rd stages) plus a skin discarded when one moulted into the next stage back in the summer. We had loads of these in the garden, dotted around like little green smarties. The remaining 5 species have been less common in the garden, but all have put in an appearance at least once this year. 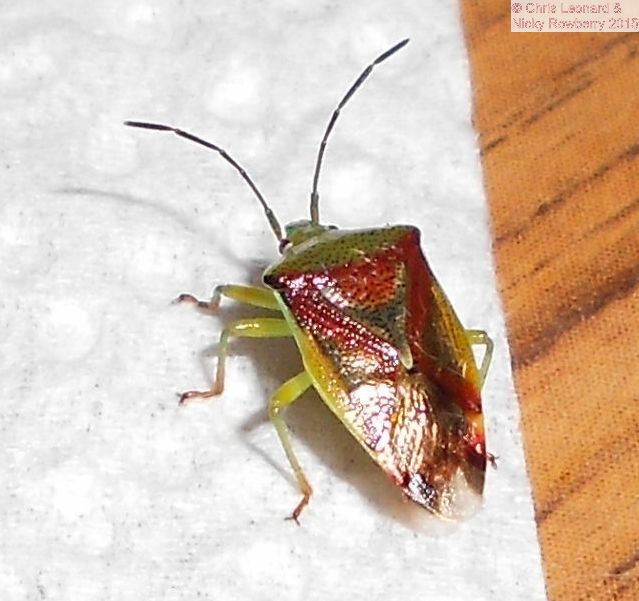 The first is the Red Legged Shieldbug – named, not surprisingly, for its red legs. 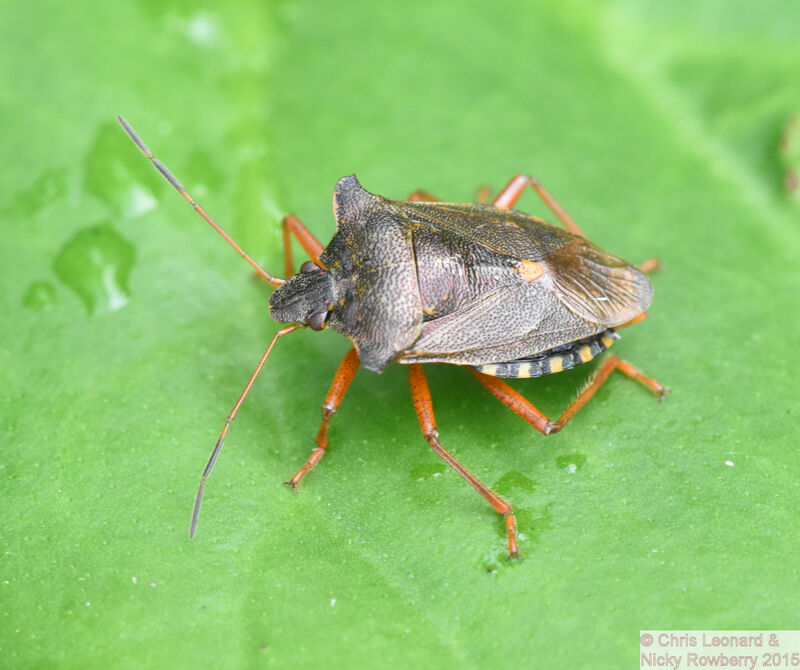 It’s a predatory shieldbug – in the world of predators, it may not rank as the most fearsome, but I guess if you’re a small caterpillar, then the Red Legged Shieldbug is perhaps your worst nightmare! The Green Birch shieldbug is apparently more of a vegetarian and has a tendency to be attracted to lights – as this one was coming to the moth trap one night. Unfortunately it didn’t hang around long enough for me to get a more arty photo, hence him sitting on a bit of kitchen towel! 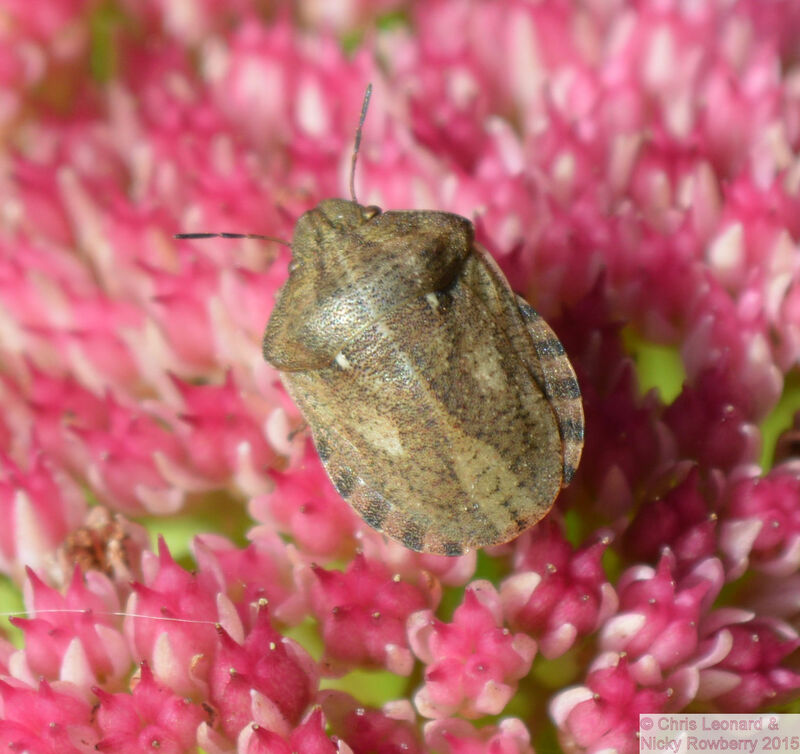 The remaining three species are the Sloe or Hairy Shieldbug, the Dock Bug and my favourite the adorable little Tortoise Shieldbug. I’m sure there must be other species in the garden waiting to be discovered – just need to fight through the weeds to find them next summer. Emptying the moth trap last weekend at the crack of dawn, I could hear the frogs croaking in the half-light, while the garden was swathed in a light mist, spider webs draped around the trees glistening with dew – made me feel like I was deep in the Louisiana swamps (I have an active imagination at that time of day it seems). 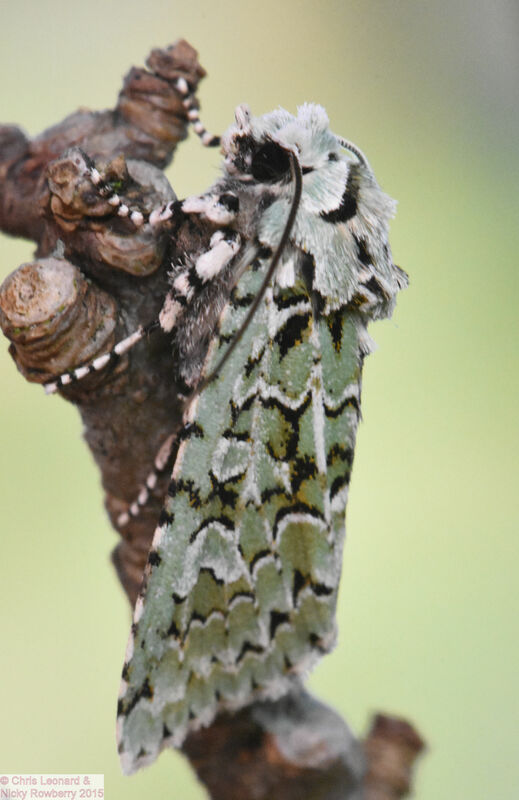 But the strange atmosphere was all forgotten when I spotted a Merveille du Jour; a French name for a beautiful British moth whose name means Wonder of the Day. I’d been wanting to see one of these little beauties for ages and been growing increasingly envious (moth envy is a terrible thing) of photos posted on Facebook showing Merveilles sitting beautifully camouflaged on green lichen. Of course my little wonder refused point blank to sit on the perfect bit of lichen I found on the apple tree, preferring instead to crawl up a brown twig – no sense of artistry! The Merveille du Jour’s appearance had the added bonus of taking my moth species tally to 150 for the year – an arbitrary target I’d set myself. 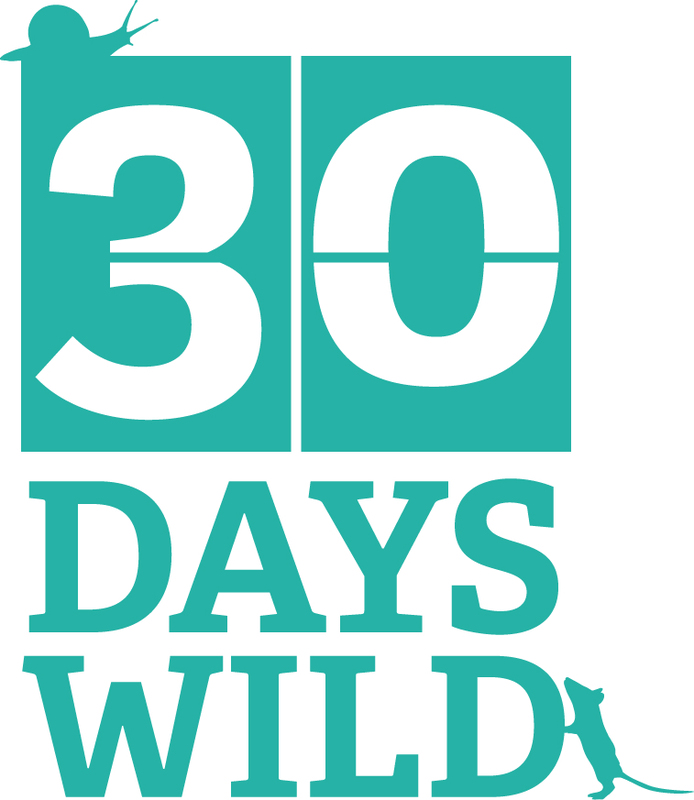 The trouble with setting yourself random targets is that as soon as you reach them, you set another one – so I now want 160 species this year! Fortunately my little wonder brought some of his mates along to the trap, so I bagged another 4 species taking the total to 154. Several of these also displayed camouflage tendencies with subtle autumn colours. 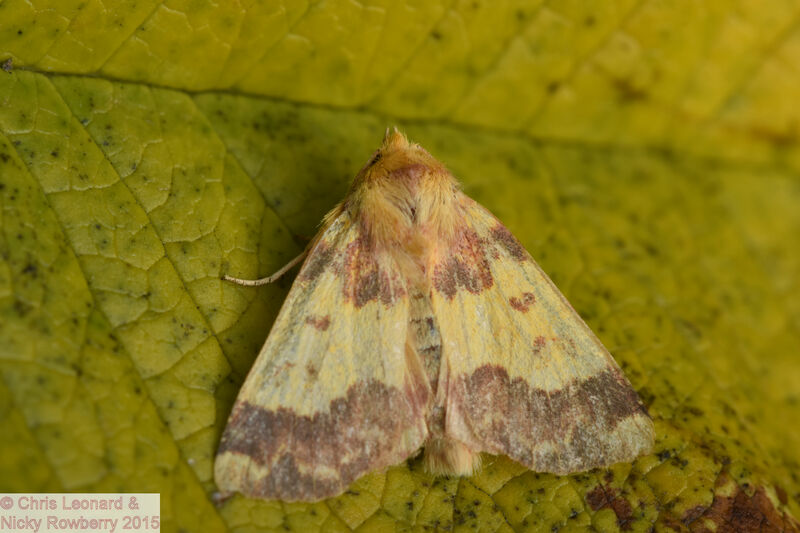 This Barred Sallow blends well amongst the leaves with its yellow and brown splotches, as did the Brick with its muted russet brown tones. 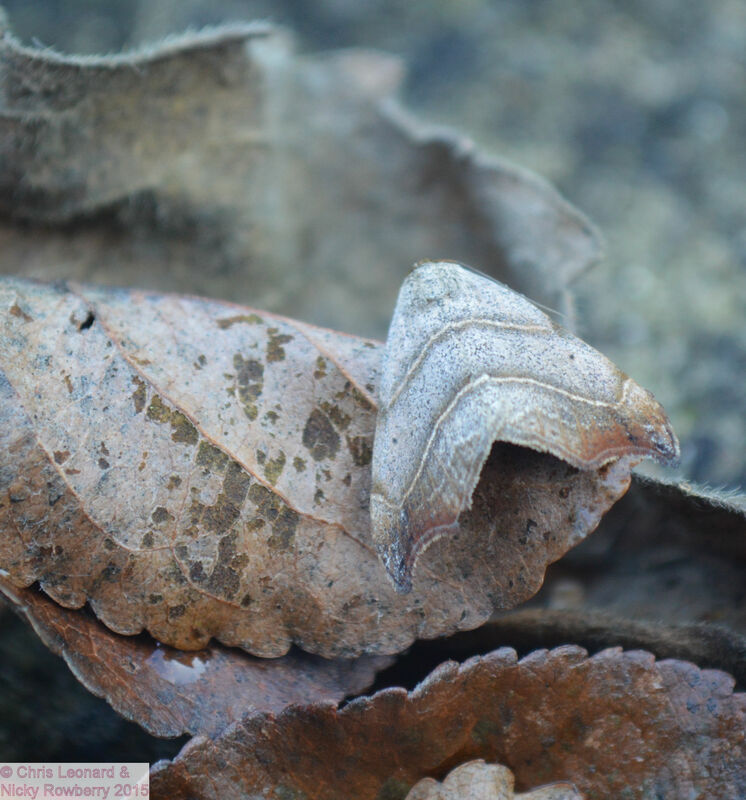 My favourite though was perhaps this Beautiful Hook Tip, whose wings even had veins and curled slightly at the edges mimicking a dead leaf. 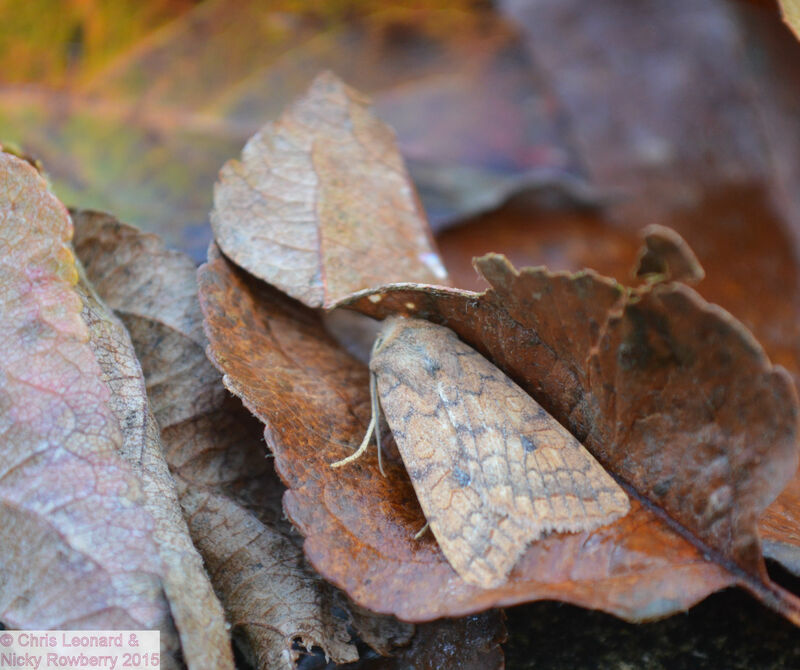 Moths have a reputation of being dull grey or brown things, but I find these autumnal moths every bit as beautiful as their more showy cousins the butterflies. Feeling very pleased with myself this month – all thanks to a bug! I had planned to follow Buglife’s Bug of the Month feature, but this month they’ve chosen a Wasp Spider and a) we don’t get them in our garden and b) I’m really not very good with spiders (huge understatement!) So I thought I’d do an actual BUG feature instead. 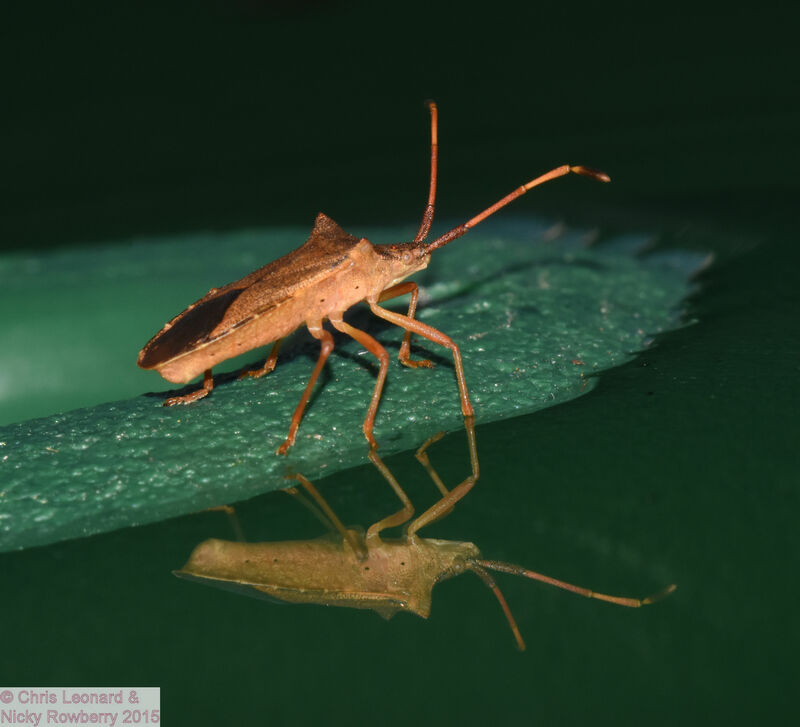 Shieldbugs are part of a group of insects called True Bugs, which always makes me imagine that somewhere out there, there are insects who go around faking it as bugs? 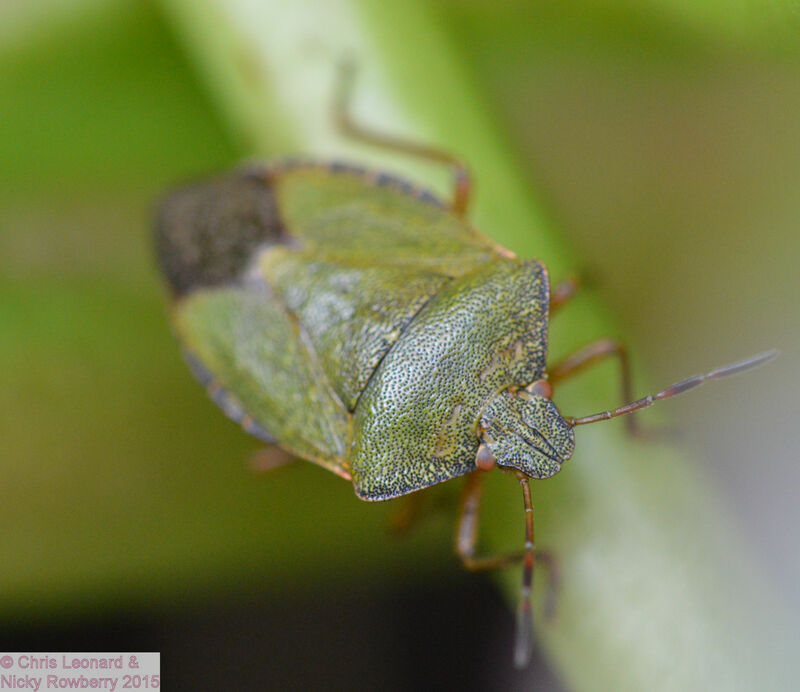 I knew we got shieldbugs in the garden, so did a trawl through the photos and tried to properly ID them for once. 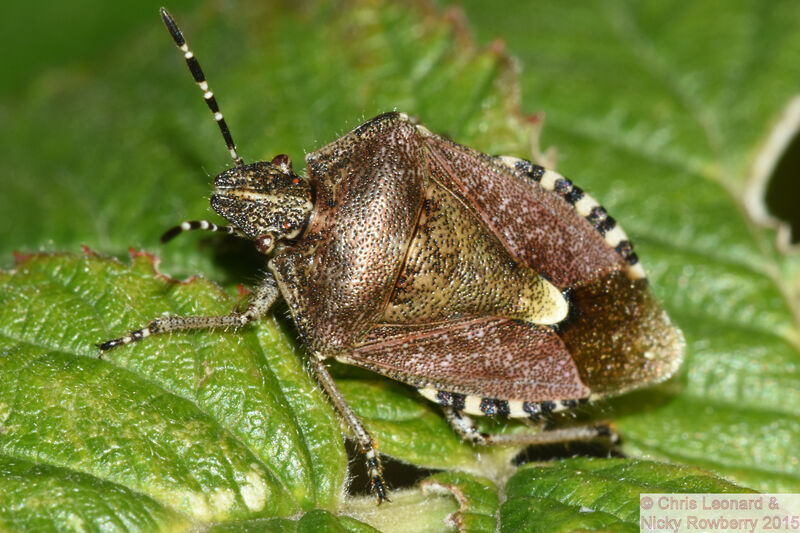 There’s a website called iSpot where you can upload photos and get help identifying them, so I got all my shieldbugs checked out. There was one bug that had landed on our birdbath last month – unfortunately our birdbath hangs quite high and being vertically challenged, I couldn’t see in. Luckily the other half is considerably taller and spotted said bug clambering through the hole in the middle. Anyway turns out this little bug was a Box Bug (Gonocerus acuteangulatus). 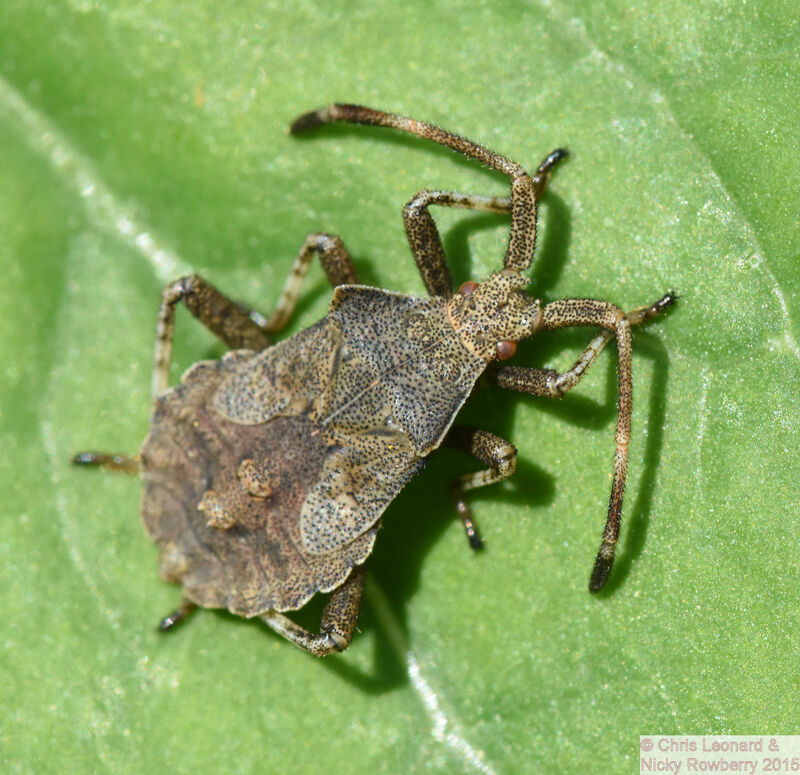 Box bugs were originally known only from Box Hill in Surrey but have recently been expanding their range. Word on the nerdy street is that our little bug in Malvern maybe the first one to be recorded as far across as Worcestershire. We get 6 other species of shieldbug in the garden; many of whom are perhaps more interesting looking than the Box Bug. But I will forever be most chuffed with this one, even though I was too short to have actually seen it!